We’ll be saying ‘farewell’ to this firetruck next spring. This fall will most likely be the last time families in our neighborhood will enjoy the current Forest Hills Playground located on 32nd and Chesapeake Streets. In spring 2014, construction is expected to begin on a massive renovation of the playground and the surrounding recreational area as part of Mayor Vincent Grey’s $32 million DC Play initiative. 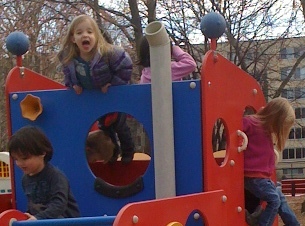 The Forest Hills Playground was one of 32 playgrounds selected to undergo makeovers as part of DC Play, and only one of four chosen to be redesigned under a partnership between the DC Department of Parks and Recreation (DPR) and the Trust for Public Land in an effort focused on actively engaging the community in the redesign process. The goal is to have a park that complements the neighborhood and will be enjoyed by all generations. The undertaking began last November with an initial community outreach meeting hosted by the DC Play team, including representatives from DPR and the Mayor’s Office, during which the project was introduced and preliminary design ideas were solicited from Forest Hills residents. Since then, four additional community meetings were held, including a design charrette that both children and adults participated in last summer, and most recently, a meeting held on September 12th to review the conceptual design plan and gather final feedback from neighbors. While the conceptual design is currently being slightly altered to reflect recommendations received during that meeting, to see the original design, please click here (download). The new park will center around an “Enchanted Forest” theme and will include an entirely new playground as well as new additions geared toward adults. All of the current wooden play structures, which are designed for children up to six years old, will be replaced with brand new metal-based structures geared toward young children as well as children up to twelve years old. 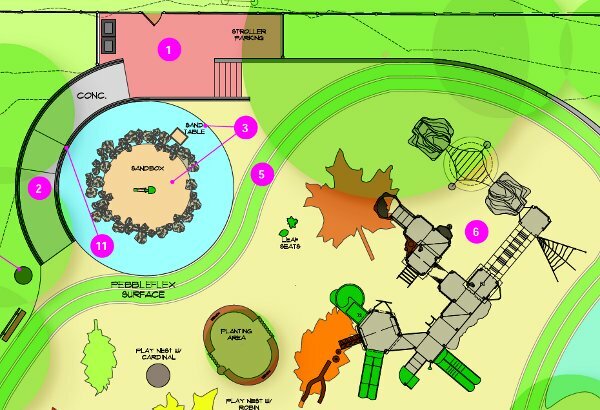 The design presented at the September 12th community meeting includes a new sandbox (upper left) and play equipment geared toward 5-12 year olds (lower right). The new play equipment will include slides, climbing rocks and walls, forts, logs to crawl through, and ‘birds nests‘ to name a few. The play structures will largely resemble that of the newly renovated Macomb playground. Other playground additions include replacing the mulch, which has proven to be very messy, with rubberized safety surface. Leaf designs will be sprinkled throughout. The current sandbox will be replaced by a slightly smaller version that will be designed to help prevent sand from spreading outside of the designated play area, thereby addressing a major problem with the current playground. 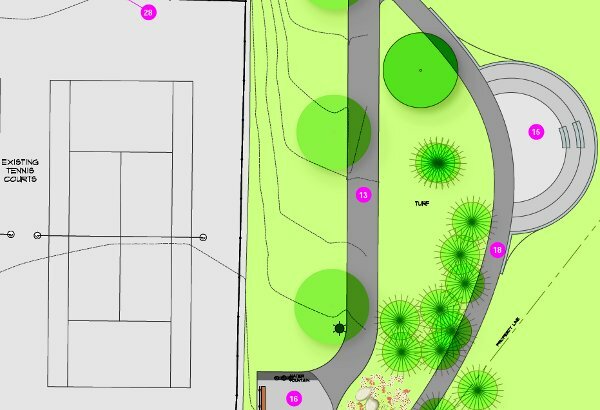 A safety-turf track will be added to allow children to ride scooters, bikes and toy cars around the play area. More swings will be added as well as a picnic area with new tables and seating. Outside the actual playground area, a ‘community circle’/amphitheater and a few more picnic tables will be added, creating a space where the community can host events and birthday parties. The design includes an amphitheater to the east of the tennis courts. The adult-focused recreational features that will be added will be located near the tennis courts on Brandywine Street. They will include a basketball half-court and an outdoor gym with at least half a dozen pieces of aerobic equipment, such as elliptical machines. There will also be a formal entryway into the park on the Brandywine side, and an adult seating area. Those participating in the September 12th community meeting included ANC Commissioner Sally Gresham (3F04), Marlene Berlin, and several Friends of Forest Hills Board Members, including myself and Vice President Virginia Adams Marentette, who have been part of a smaller working-group on this renovation project with DPR/Trust for the past year. Almost a dozen other neighbors provided some additional feedback on the designed concept, all of which the design team is working to incorporate. With regard to the playground area, participants asked for a small carousel and a four-person seesaw to be added, similar to the ones at the Macomb playground. One participant asked that a playhouse be added, while another requested that the new sandbox be expanded to the same size of the current one. With regard to the Brandywine side of the design plan, participants asked that it be kept adult-focused, which means removing a “play seating” structure that was in the original plan and incorporating the adult aerobic outdoor gym mentioned above. Some residents also asked that DPR add better lighting along the walkway that will be redone along the pathway between Chesapeake and Brandywine Streets. Others expressed concern that the gazebo, which is currently in poor condition and deemed unsafe, will no longer be present. To make up for the gazebo seating area, there was discussion about adding picnic tables, and possibly some kind of covering near the new amphitheater area. The design team also confirmed that very few of the existing trees in the park will be impacted during construction, with the exception of a few diseased trees where the new basketball court will be built. The team plans to add quite a few new trees throughout the area, particularly along the main path between Chesapeake and Brandywine. While the design team is moving swiftly on the final updates to the plan, but we won’t see any results for a few months. The construction phase of the project can only take place when temperatures can be expected to be consistently above fifty degrees, which is why the “ground-breaking” has been delayed until springtime. The renovation is expected to take anywhere between two to four months, during which time the playground and surrounding area will be completely closed. For now, the playground remains open and in regular use. So during these final weeks of nice weather, families will continue to enjoy the current park, and that includes attending a big celebration in a couple weeks. The Friends of Forest Hills Playground will be hosting its annual Halloween Party on Sunday, October 27th from 10 a.m. until noon, which will include a magic show, costume parade, arts and crafts and a bake sale. The party will be the last large community gathering at the park before the big ribbon-cutting celebration that will take place in the late spring or early summer of next year. I am concerned that none of the excellent proposed innovations include areas for teens, thirteen and above. The newly rennovated tennis court excludes both skateborders as well as dogs even in hours when the courts are not in use. The nearby baseball diamond and field attract mainly young children and their families. However, there appears to be no effort to develop outdoor opportunities for teens whether for individual and/or group activities.